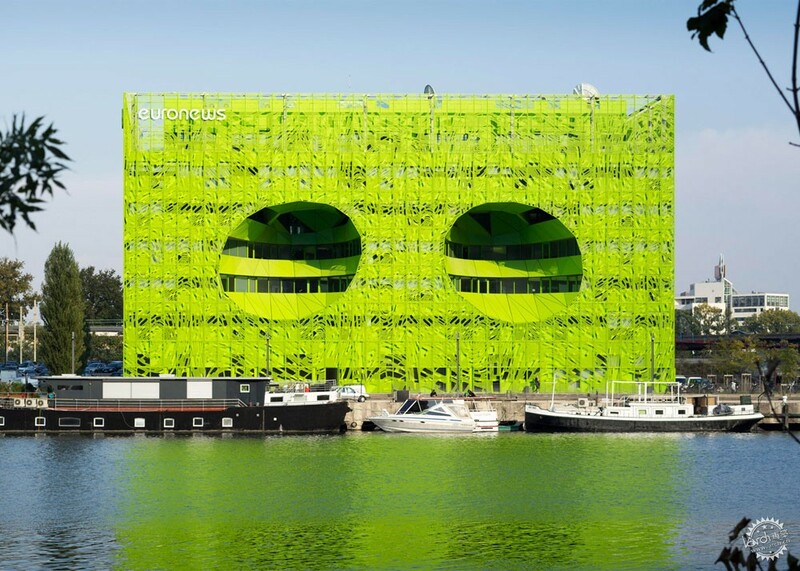 Built in Lyon's docklands, Jakob + MacFarlane's new headquarters for international news channel Euronews features an acid-green facade punctured by two huge egg-shaped holes . 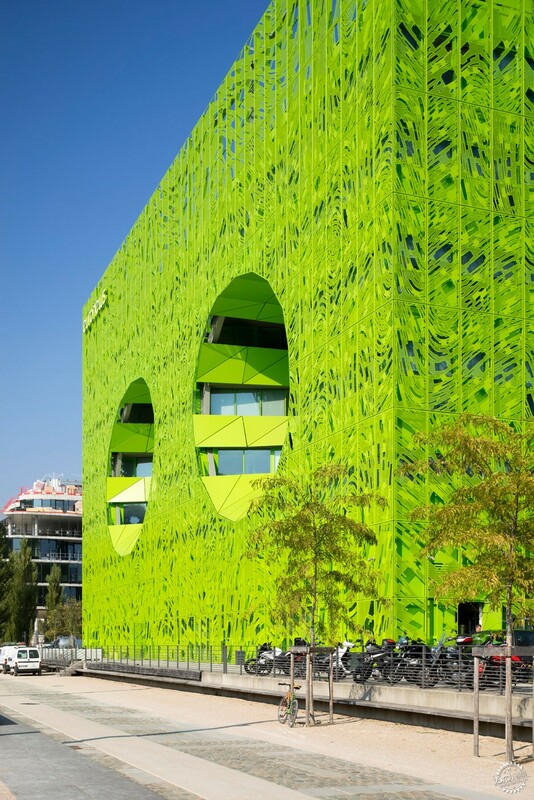 Paris-based Jakob + MacFarlane collaborated with French artist Fabrice Hyber on the waterside building. 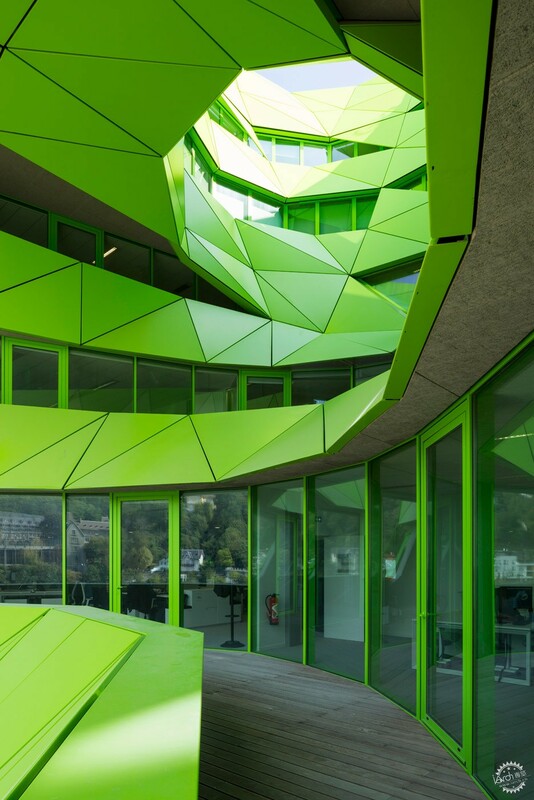 Hyber was responsible for the building's green aluminium skin, which features a sinuous pattern of openings that allow light and air to filter inside. "These are waves, like sound waves or diffusions. But also like those of water, or flux," said the artist. "Since 1986, green has been my colour of communication. I thought that our two universes, that of Jakob + MacFarlane and mine, could meet – our waves crossing each other." 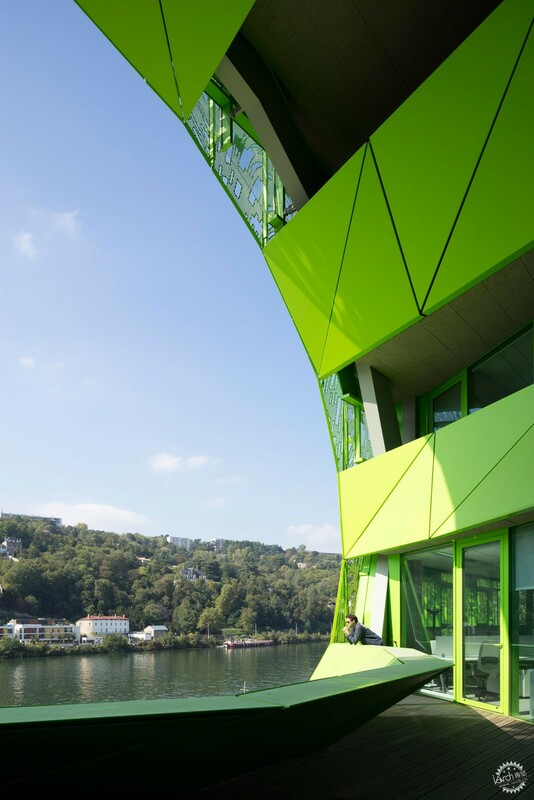 The two egg-shaped cavities in the facade operate as lightwells, which allow air to filter into the offices as well as providing views over the docks. The openings burrow into the heart of the building and up through the roof. 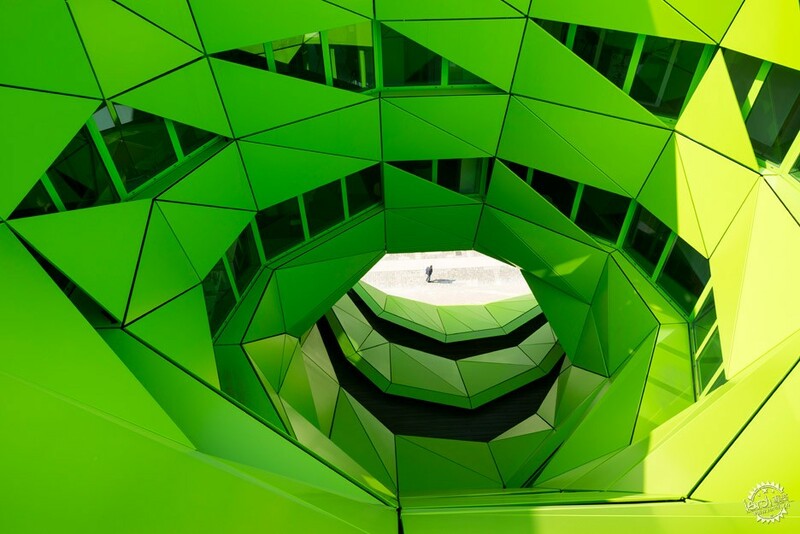 "These atriums are imagined as two gigantic eyes looking onto the river and its environment," said Jakob + MacFarlane. 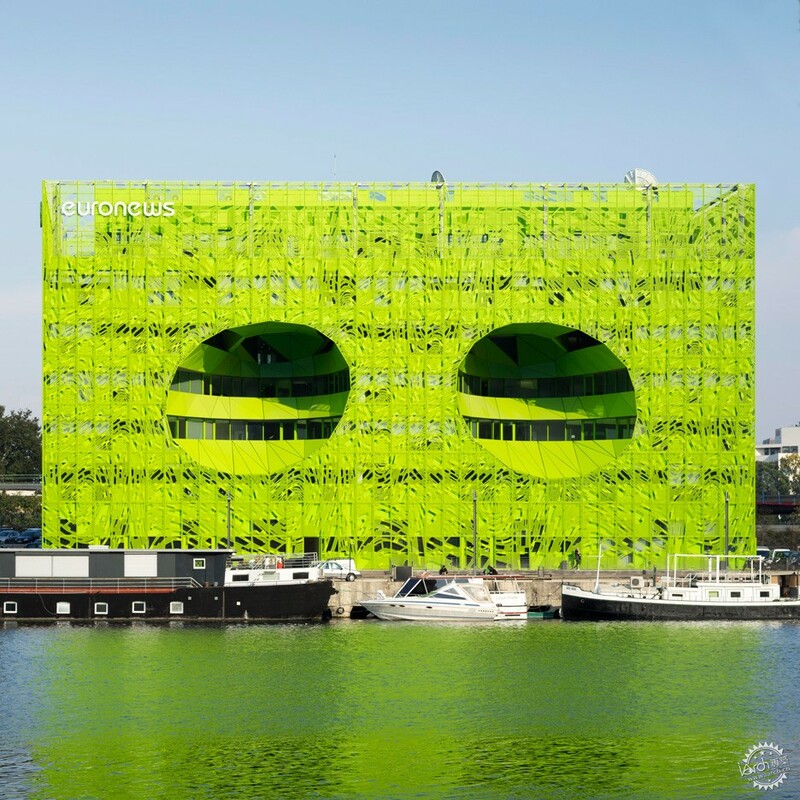 "Symbolically, the eyes also represent those of Euronews, abstract receptors, capturing the events of the world around us." 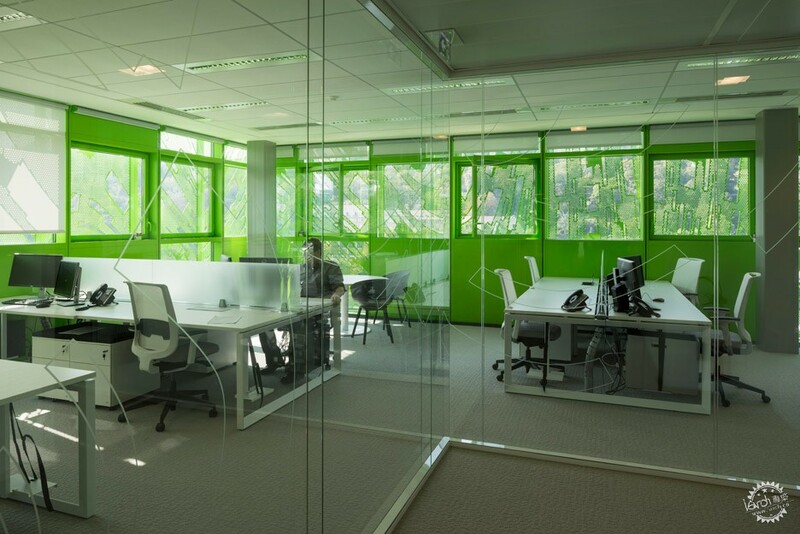 Euronew's 800 employees are accommodated within the 10,000 square metres of office space that is split across the building's six levels. The media organisation has been based in the city since its launch in 1993 but needed to move to larger premises to accomodate the growth of its digital, mobile and social network departments. The building is situated on the Rambaud quay overlooking the Saône river in the redeveloping district known as La Confluence. 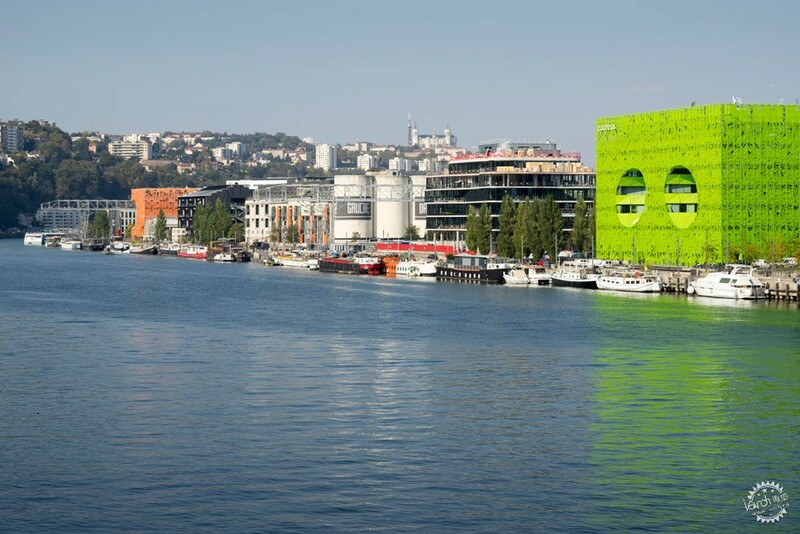 The 150-hectare site at the junction of the Saône and the Rhône river is undergoing the second phase of its overhaul, as part of a masterplan by Herzog & de Meuron. 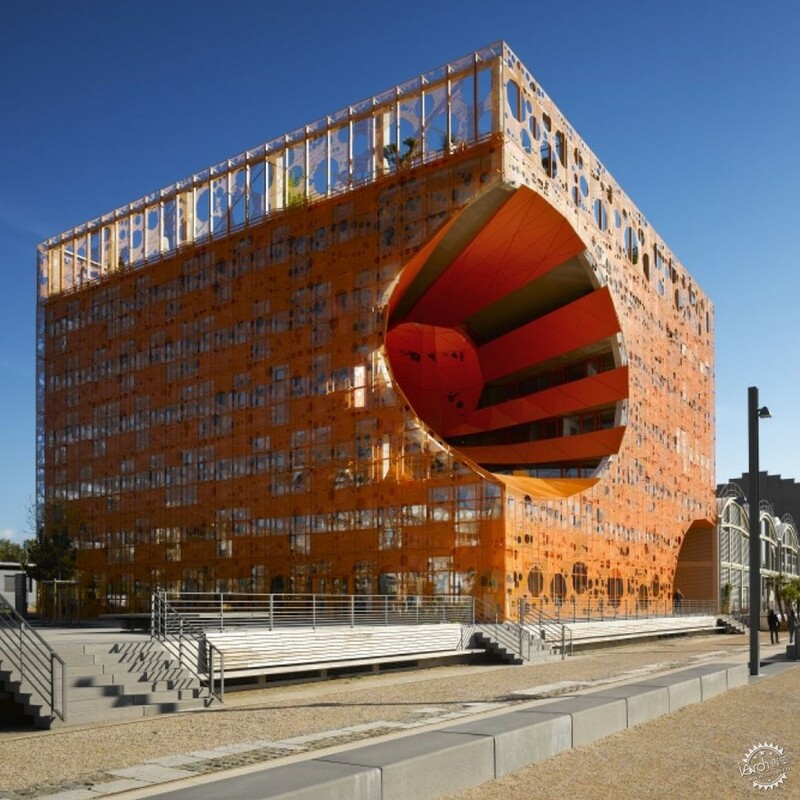 The Euronews Headquarters was planned concurrently by Jakob + MacFarlane with The Orange Cube, an earlier building by the firm that features a perforated tangerine facade. 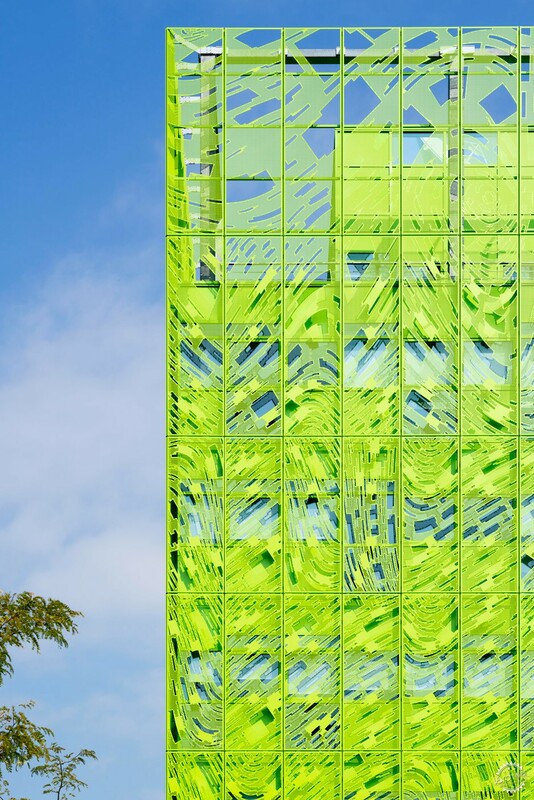 "These buildings are part of the same conceptual family, yet each exhibits a unique morphology," said the firm. The newsroom, control rooms and recording studios are accommodated on the upper levels of the building and have access to balconies around the two atriums, while a restaurant and lobby are located on the ground floor and a car park in the basement. The lobby connects the quayside with a road at the back of the building, providing two approach routes. Neighbours include the Musée des Confluences, a natural history museum designed by Austrian studioCoop Himmelb(l)au and La Sucrière, a former warehouse now used as an exhibition space.